This post was originally published on the Maps and Music blog. 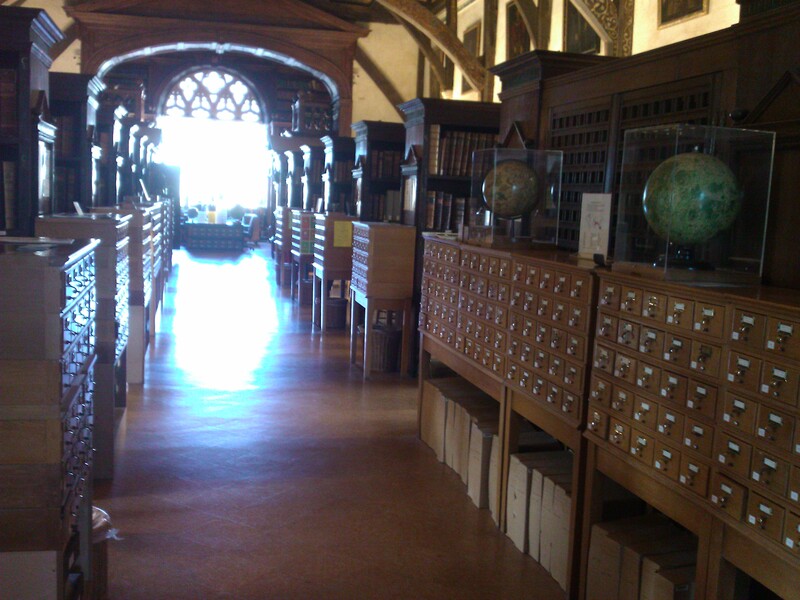 This concerns the ongoing project to digitise the Map and Music Room card catalogue (pictures of which, in situ in Duke Humfrey’s Library, illustrate this piece); records for the whole map collection should be available on SOLO by autumn this year. When I was at university (quite a long time ago) one of my favourite things about ancient history was the tutor’s habit of starting each session by unrolling a large map on the floor. He rightly insisted that we couldn’t possibly understand Rome’s civil wars or the Greece’s war with Persia if we didn’t know where the cities, roads, mountains, rivers, islands, fleets and armies were. 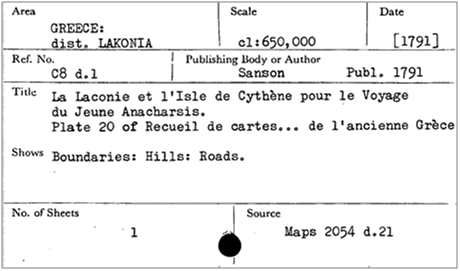 Working on the project to digitize the Map Room’s card catalogue has shown me a different link between maps and history. I’m one of a small team editing the text of the new digital records. 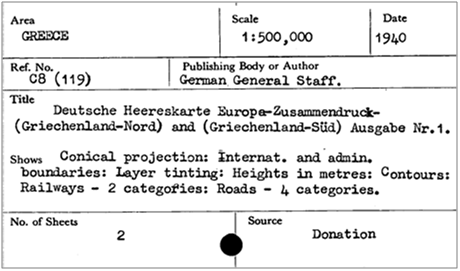 We compare text generated by OCR (optical character recognition) against scans of the original record cards. The editing process takes you through a lot of cards. Thousands in fact, as between us we need to edit over 200,000 by next spring. Records are allocated to editors in geographical batches, reflecting the order of cards in the current index. 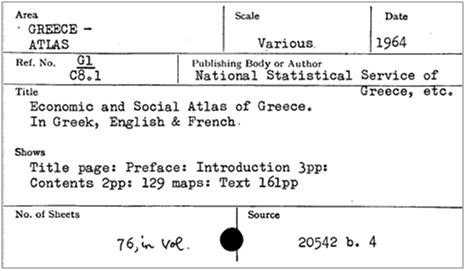 The records in my first set were for maps of Greece. 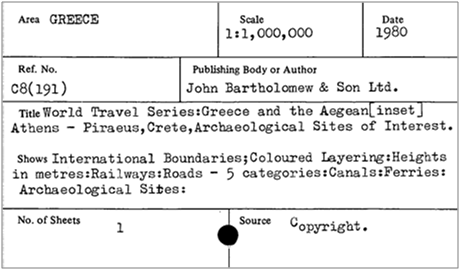 First impressions were that there was a bewildering variety of maps of Greece made by a bewildering number of map-makers and publishers… But a few thousand cards later a pattern started to emerge, with a loose correlation between the dates maps were produced and the types of maps. It was not just that the techniques and conventions of map-making were changing over time. 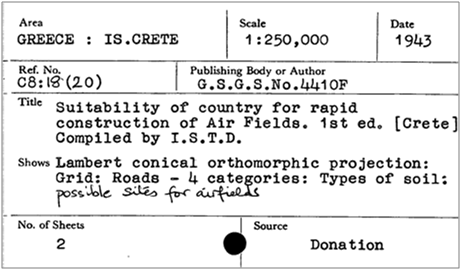 There was also a definite link between the date of the map, the sort of person or organisation that made it, and why. Here are some examples of the main types of map I noticed repeating. Lots of eighteenth century maps retracing the voyages of a fictional Scythian, Anacharsis the Younger. Touring and tourist maps. These start appearing in the 1930s but there are many more from the 1960s and later. In the eighteenth century Greece was something of a fantasy land to Europeans – more familiar in classical literature and contemporary fiction than reality. In the nineteenth century the serious study of ancient history began and classicists made maps to represent their understanding of past events. Then there is a lull in interest in Greece – or at least that’s what the collection suggests – until the twentieth century. Suddenly Greece becomes a real place of contemporary interest. 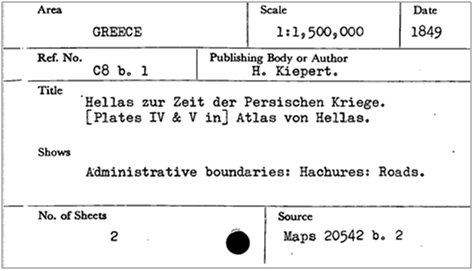 During the Second World War, the German army drew up maps to plan the invasion of Greece, and the British military made maps to plan the counter-attack. 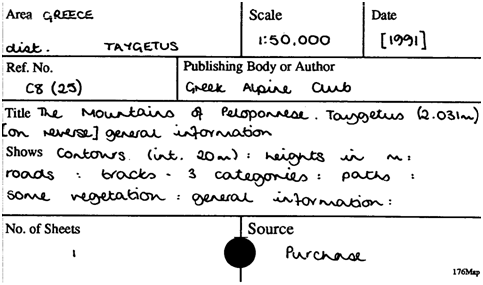 In the 1960s the Mediterranean holiday industry exploded and tourists had maps to plan their assault on Greece. More recent maps from the Map Room collection are made by Greeks for Greeks – statistical maps to assist government planning or detailed walking club maps of the Peloponnesian mountains. Looking at the catalogue this way can give you an insight into why people made maps, where they were going, and what they planned to do when they got there. It also makes editing several thousand cards a much more interesting process. You’re not just reading the words of a catalogue, and it’s not just a catalogue of cartography or geography. It’s history too. This entry was posted in Uncategorized on 17 March 2014 by michaelathanson.